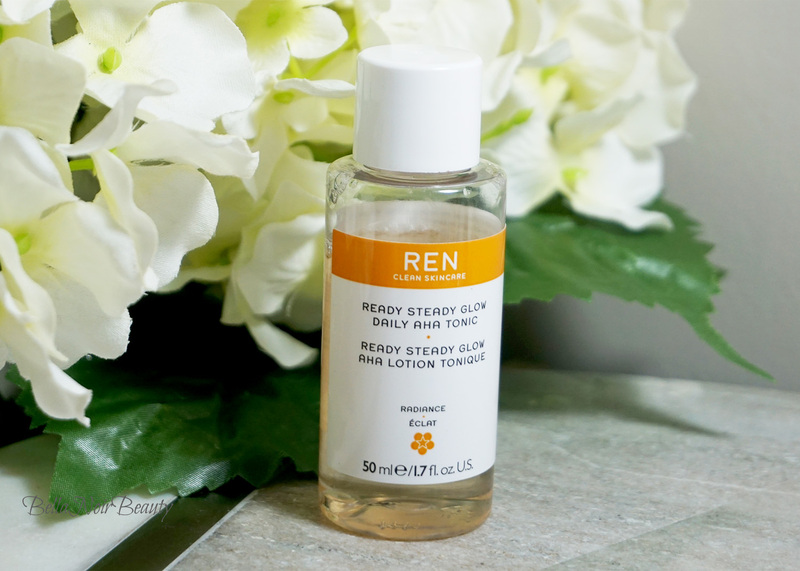 My love for lactic acid doesn't appear to be going anywhere Here are some thoughts on the Ren Ready Steady Glow Daily AHA Tonic I have been testing. I have oily skin, with a concern focused on acne scarring. I have dark marks on my cheeks and chin and exfoliate regularly, chemically and physically to combat that. This effective, skin-resurfacing toner exfoliates and brightens the complexion, while being gentle enough to use daily. Lactic Acid and Willow Bark extract (a natural BHA) work together to smooth, tone and reduce pore size by stimulating the skin to naturally exfoliate. Azelaic Acid precursor brightens and evens out skin tone for a naturally radiant glow. Formulated with a pH between 3.5 and 4.5 for for real results without irritation. I use this as a toner right after cleansing. I spill some on a cotton pad and swipe it all over my face morning and evening. I could not believe that they were giving so much of this stuff out as a sample. I mean, toners usually have more product than other skin care products, but I have purchased some skincare products for 50 ml. I used it consistently for two weeks and I still have half the bottle left. I like lactic acid; that's been established. It's not too boring - it's got a bit of a scent to it. It's gentle on the skin and I only feel tingling after physical exfoliation. It fit nicely in my skincare regimen and I'm sure I'll come back to it, as Ren is a brand that I find myself attracted to. This is probably gentle enough for skin not used to acids and also works for skin that's used to acidic beat-downs (like mine). This is also a good "come-down acid" for me. If I need to take a few days in between acids, but still reach for them out of habit, this tonic is gentle enough to not overexfoliate. I think for this, I would say YMMV. I don't feel like it's strong enough for my skin to make a difference after completing the entire bottle. I do this thing where if I don't feel any sensation after using an acid, my thought is that it must not be working. I am working on getting out of this mindset. Not everything needs to burn to work! I think this is a fair lactic acid, especially for beginners. I would place this after my Blithe Splash Mask, as far as desirability and I suspect that people not obsessed with acids in skincare will love this one.